Call 3-1-1 and tell City Council to do the right thing - Ax the Bev Tax! The Philadelphia City Council just introduced legislation that takes the first step toward repealing the harmful beverage tax. This proposed legislation includes a study of the tax and potential options for a revenue replacement for the city as well. We appreciate that these Council Members now understand that the beverage tax is a harmful policy. However, we don’t need a study to know that the tax hurts working families across Philadelphia and should be repealed. 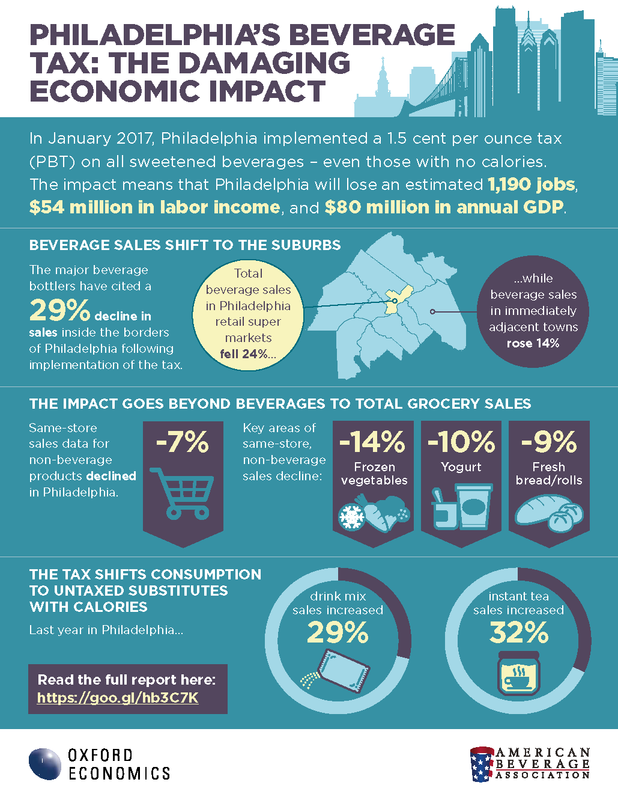 Since the beverage tax went into effect on January 1, 2017, Philadelphia has paid the price. This tax has cost 100 union jobs when it caused the closure of a West Philadelphia grocery store. Further, it was corrupt in its very creation – passed because of a political vendetta by one union against another. Philadelphians deserve more from their elected officials. It is time for City Council to do the right thing. The city has plenty of money in its $368.7 million surplus and needs to find another way to fund important programs like pre-K and parks and recreation centers. Tell your Council Member enough is enough. It’s time to repeal the beverage tax. In January 2017, Philadelphia implemented a 1.5 cent per ounce tax (PBT) on all sweetened beverages – even those with no calories. The impact means that Philadelphia will lose an estimated 1,190 jobs, $54 million in labor income, and $80 million in annual GDP. To download the full PDF, please click here. Write to your City Council Member and urge them to repeal the beverage tax.